There is something that tells us that the official chronology of human history is completely wrong. There are findings that indict there was another civilizations way before us on Earth, a civilizations that had knowledge and technology far superior than what we have today, a sophisticated society that could answer the numerous enigmas surrounding our civilizations and ancient history. Having that said, I have to mention that without a doubt the followers of Horus remain as one of the greatest and most mysterious enigmas for researchers and historians when it comes to Egyptian history. These ‘mythical beings, referred to in the Turin Papyrus, the Palermo stele and other ancient texts, tell the unsettling story which some mainstream researchers have classified as disturbing and nothing more than empty mythological tales, the truth however is far more surprising. Reference to the mysterious ‘beings’ can be found in several texts. We learn of their existence in ancient Egypt before the first dynasty of Pharaoh’s. For Egyptologists, these beings are mythological entities, the result of ‘wild stories’ that were taken out of context by many, yet their existence seems to be of extreme importance. This means that history as we know it, when it comes to Ancient Egypt needs an urgent update, an update that can welcome the new theories and evidence postulated by researchers who decided to question official views and look for alternative explanations. There are numerous researchers who disagree with mainstream views on Egyptology. These ‘alternative thinkers’ believe that the Ancient Egyptian Civilization is much older than what mainstream history is telling us, and Gaston Maspero, one of the most influential personalities in Egyptology raised an important questions in the mainstream views of ancient Egyptians history. Where did the ancient Egyptians come from? What is their true origin? Maspero was able to combine with incredible skill an explorers profile with that of an experienced archaeologists and concluded that the people who created this sophisticated ‘corpus of belief’ were already present in modern day Egypt long before the first dynasties of ‘mortal’ Pharaohs ruled over the lands of ancient Egypt. In order to understand the origin, beliefs and the incredible stories behind the ancient Egyptians we must change our thinking methods and look at our history from an entirely different perspective. Some of the beliefs of Maspero might sound surprising to many archaeologists and researchers but Maspero simply reflected the beliefs and the ancient Egyptians in relation to their ancestors, underlining the importance of Pre-Dynastic Egypt and the time of the Followers of Horus, the race of semi-divine beings that ruled over the lands of ancient Egypt before mortal Pharaohs. But much before Maspero, others looked back at ancient Egyptians history from a completely different point of view. Manetho (III century BC), was an Egyptian priest and historian who lived during the reign of Ptolemy I and Ptolemy II. He, like many others after him referred to these gods and demigods who ruled over Egypt in his work Aegyptiaca (History of Egypt). Manetho established four dynasties before Menes, two of gods, demigods and a fourth transition suggesting the origin of the Egyptian civilization can be attributed to 7 major deities: Ptah, Ra, Shu, Geb, Osiris, Seth and Horus, who ruled over the lands of Egypt for a period of 12,300 years. After them, a second dynasty ruled over Ancient Egypt led by Toth, composed of 12 ‘divine Pharaohs’ who ruled over 1500 years and after which 30 demigods rose to power, these were usually identified with the Followers of Horus and were symbolized as Falcons and ruled the lands of ancient Egypt for a period of 6,000 years. After the rule of these ‘otherworldly’ beings, Chaos ruled over the lands of Egypt until Menes managed to restore order and unify the land of ancient Egypt. 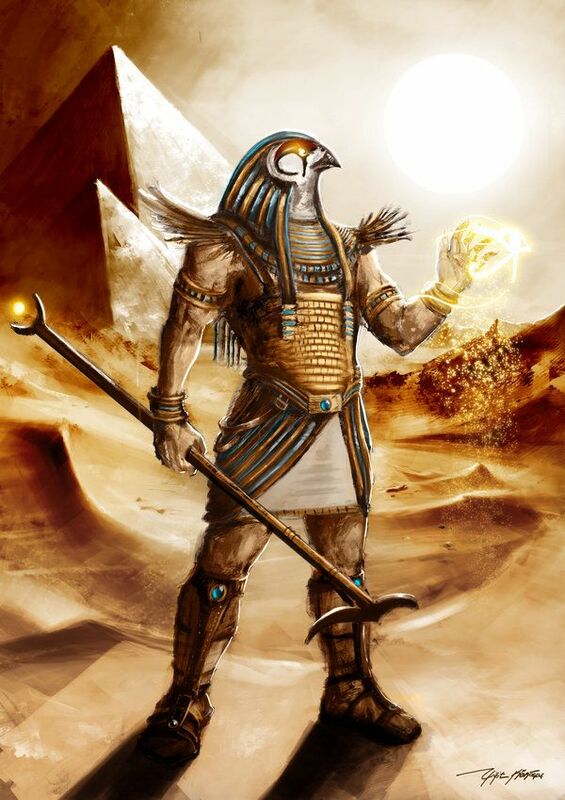 The best known reference to the Followers of Horus is found in the Royal Canon of Turin, a fragmented papyrus that tells us, that these mysterious beings ruled Egypt for approximately 6,000 years, in an interim period between the reign of the gods and the early dynasties of pharaohs. This invaluable ancient text kept in the Egyptian Museum in Turin, Italy is also referred to as the Royal Papyrus of Turin and literally contains a list of rulers of Ancient Egypt, before and after ‘the followers of Horus’ ruled the lands of Ancient Egypt. The ancient document contains a list of the rulers of ancient Egypt from Menes (or Narmer) to the troubled XVII dynasty. Although the beginning and the end of the list is lost, at the back of the papyrus a detailed list of Ancient Egyptians rulers before the ‘first mortal Pharaoh’ is displayed, rulers of ancient Egypt which were ‘divine’ or ‘semi-divine’ and were not mortal humans like Menes. One of the biggest questions is… how should scholars interpret the Royal Canon of Turin? What about the mysterious beings who ruled over Egypt before the time of the Pharaohs? Were these beings real, flesh and blood rulers? Or are they mythological rulers that did not exist? Mainstream archaeologists seem to undermine the historical significance of this incredibly valuable ancient text, ignoring completely the contents that do not fit into their views of history. The reason behind is simple, if the ancient text do not agree with their version of history, it must be irrelevant, fake, or made up. This however isn’t exclusive to ancient texts that challenge history, the same thing is done with researchers who question mainstream archaeological views, in that list we can find researchers as Robert Schoch, John Anthony West, Robert Bauval, Graham Hancock and Semir Osmanagic who have questioned not only history, but the core foundations of our society. While today, no one can accurately say who built the Pyramids of Giza nor the Great Sphinx, it is firmly believed and accepted by many that these incredible monuments of the Giza Plateau predate the ancient Egyptian civilization by thousands if not, hundreds of thousands of years. It is very possible, according to many researchers that the Followers of Horus and those who ruled before them could have created some of the most enigmatic monuments we see in Egypt today. If we learned anything from the ancient texts and authors mentioned in the article it is that today’s scholars have become extremely selective, accepting only what fits into their ‘narrow’ view on human history while rejecting and censuring potential theories that could revolutionize everything we know about the history of mankind. Proof of the selective approach of mainstream scholars is the fact that today’s Egyptologists still use Manetho’s dating, which is considered perfectly reliable for everything related to the “officially” recognized dynasties, while avoiding anything that relates to the prehistoric dynasties. Edgar Cayce was very clear about the construction of The Great Pyramid. He stated that it was designed and constructed from 11390 BC to 10390 BC. It was designed and constructed by Ra Ta and Hermes. In other readings he stated that he, Edgar Cayce, had been Ra Ta in a previous incarnation. Ra Ta, according to Cayce, was the High Priest of Atlantis at the time the Great Pyramid was constructed. I have never seen anything he said about the construction of The Sphinx, although it appears it was already in existence at the time The Great Pyramid was constructed. Today, archaeologists claim The Great Pyramid is only about 3500 years old. As they discover more, the real history of mankind will eventually emerge, including Atlantis and the Halls of Records, supposedly yet to be discovered, although I personally believe at least one Hall of Records has already been discovered and is being kept secret.